Here’s another good reason you should make sure all exterior openings are sealed. During the home inspection I usually discuss with my clients the importance of making sure that all exterior openings are sealed so that moisture and insects can not infiltrate. This home had been sitting empty for quite a while. 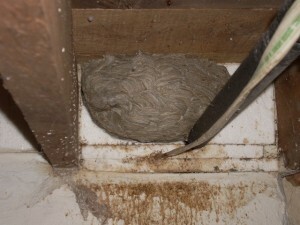 The bees found a way in through a disconnected dryer vent and built quite a large nest. Lucky for me, someone has smoke bombed the place and killed all of the bees…. there were hundreds of dead bees throughout the home, mainly in the basement.